This is a great product and it is working well. First-class service from Tayna, Package arrived next day by courier. Would have no hesitation in using Tayna again and would certainly recommend them. Very pleased with this purchase. It was recommended to me by a neighbour and having used the charger I am very satisfied with it. Excellent charger. Exactly the same as the mercedes charger only much cheaper. Brilliant piece of equipment, easy to use, did a great job. 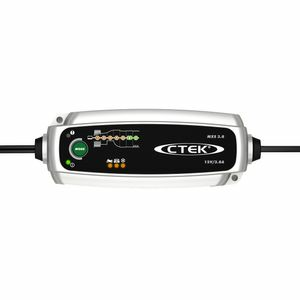 The CTEX charger is simple to use and clearly a high quality product. Unable to use it as it is the wrong one for the battery I have despite having asked advice from Tayna before buying . Easy to set up and use - had it working in minutes (once I had enlarged the holes on the end of the supplied cable to fit over the battery terminal clamp bolts). An excellent product that does the job as specified. Unfortunately the "connect and disconnect the charger to a battery" section in the manual is extremely hard to understand. This was overcome by fitting the comfort connect eyelet cable. I still would not know how to correctly use the clamp cable if it was necessary. As it is I am happy with the unit. A very very nice little piece of kit. It works beautifully.